New York City is starting a transition to give new life to its often ignored payphones by transforming them into Wi-Fi hotspots. The initiative is starting with a pilot program set up at 10 payphone hotspots spread across Manhattan, Brooklyn, and Queens. Each payphone is outfitted with a military-grade antenna, providing Wi-Fi to a 300-foot radius. Access is completely free, with users only required to accept certain terms and conditions and make a visit to the city's tourism page before browsing the web at their own leisure. 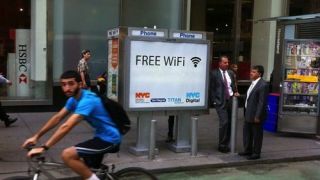 The service is currently ad-free, unless you count the required tourism page visit, though it wouldn't be surprising if that changed to offset the cost of installing and maintaining hotspots as the service rolls out to the more than 13,000 payphones throughout New York City. The conversion of payphones to hotspots joins the city's ongoing efforts to make New York more wireless friendly. This includes a five-year plan for AT&T to install hotspots in the city's parks and initiatives to bring more access points to city schools, libraries, and senior centers. Free public hotspots provide less congested cellphone traffic as people use the free city Wi-Fi on their smartphones instead of their own data plans. It also promotes tourism, giving city visitors a way to keep in touch with home while avoiding roaming charges. There is also the side benefit from giving the city's payphones a new purpose, with an estimated 40 percent to 60 percent of New York's payphones out of service. The first batch of eyesores turned Wi-Fi are up and running around the city, with more to come if the initiative proves popular.